The short answer to the question of how much the rich pay in federal income taxes is . . . a lot! 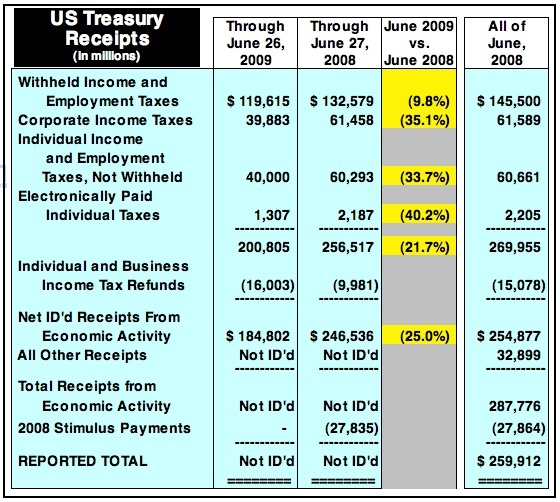 And the data for that assertion comes from the IRS. “Indeed, the IRS data shows that in 2007—the most recent data available—the top 1 percent of taxpayers paid 40.4 percent of the total income taxes collected by the federal government. This is the highest percentage in modern history. By contrast, the top 1 percent paid 24.8 percent of the income tax burden in 1987, the year following the 1986 tax reform act. “Remarkably, the share of the tax burden borne by the top 1 percent now exceeds the share paid by the bottom 95 percent of taxpayers combined. In 2007, the bottom 95 percent paid 39.4 percent of the income tax burden. This is down from the 58 percent of the total income tax burden they paid twenty years ago. Below is a chart that Hodge included with his post. The complete study, Fiscal Facts 183, contains the supporting data as well as several charts. The Heritage Foundation has additional comments at their blog, The Foundry. UPDATE (7/31/09) At American Thinker, citing the the same Tax Foundation study, Rick Moran also notes the "war on successful people continues unabated," and cites "Nancy Pelosi's choice comments yesterday referring to insurance companies as 'villains' is only the lates in in series of statements." The Economic Cost of Raising Tax Rates? “President Obama appears intent on carrying out his campaign promise to raise tax rates on high-income households, but the surtax proposal that passed the Ways and Means Committee to finance health care expansion goes much further than most had anticipated. This is a policy to be wary of. The report is accompanied by a “Book of Charts,” containing a wide array of charts depicting federal revenue and spending. Below is just one that breaks down the proportion of federal income taxes paid by income group, and shows the top 10% of income earners paid 71% of federal income taxes. If you take a look at one of the “interactive” charts, you will note that the percentage has been growing since 1980 when the top 10% of income earners paid less than 50% of all federal income taxes. “President Obama and other leading Democrats have proposed creating a new government health insurance program as an option for Americans under the age of 65, within the context of a new, federally regulated market — typically described as a "National Health Insurance Exchange." Supporters claim that a new government program could deliver higher-quality health care at a lower cost than private insurance, and that competition from a government program would force private insurers to improve. “A full accounting shows that government programs cost more and deliver lower-quality care than private insurance. The central problem with proposals to create a new government program, however, is not that government is less efficient than private insurers, but that government can hide its inefficiencies and draw consumers away from private insurance, despite offering an inferior product. “A health insurance "exchange," where consumers choose between private health plans with artificially high premiums and a government program with artificially low premiums, would not increase competition. Instead, it would reduce competition by driving lower-cost private health plans out of business. President Obama's vision of a health insurance exchange is not a market, but a prelude to a government takeover of the health care sector. In the process, millions of Americans would be ousted from their existing health plans. “If Congress wants to make health care more efficient and increase competition in health insurance markets, there are far better options. In addition to the above Policy Analysis, watch Cannon and Sally Pipes, president and CEO of the Pacific Research Institute, discuss “What Government-Run Health Care Really Means" in a Cato policy forum on July 15, 2009. “According to reporter Michael Kranish of The Boston Globe, both the House and Senate versions contain language that would fund billions of dollars in pork-barrel items such as walking paths, streetlights, jungle gyms, and farmers’ markets, which proponents are describing as an attempt to upgrade “health infrastructure” and transform communities. “According to The Boston Globe article, the language to fund these pork-barrel items “was inserted at the urging of a nonprofit, nonpartisan group called Trust for America’s Health.” The Senate bill, commonly referred to as the Kennedy-Dodd bill, contains the most explicit descriptions of these projects, including a section which matches, word-for-word, language that was provided by the group, calling for the creation of an “infrastructure to support active living and access to nutritious foods in a safe environment.’’ In December 10, 2008 congressional testimony before the Senate Health, Education, Labor and Pensions (HELP) Committee, Trust for America’s Health provided detailed examples of the kind of taxpayer-funded healthcare infrastructure they support, including grants for bike paths, jungle gyms, and lighting. The group has also lobbied Congress to establish a “Community Makeover Program,” which apparently entails spending money to beautify streets. “During the June 23, 2009 HELP Committee markup of the bill, Sens. Michael Enzi (R-Wyoming) and Tom Coburn (R-Okla.) offered several amendments to prohibit taxpayer dollars from being spent on such wasteful projects but their amendments were defeated. "Lifestyle pork." Another way to waste taxpayer money. Sheesh! “(W)hen a private producer sees the arrival of a competitor likely to offer better products at lower prices he fears that he might lose clients and that this competition will be “harmful” for him. He might be tempted, against all logic and any moral sense, to denounce this competition – a competition that will perhaps be called “unfair” – and call for the intervention of state coercion in order to put an end to the other producers’ freedom to produce and sell. Of course, if his complaints are heard and if a state sets the protections necessary to allow him to continue offering products that are less satisfactory for his clients than his competitors’ products, there will be victims. Namely, the consumers deprived of potential gains and the other private producers deprived of their normal markets. It is therefore not competition that is harmful, but the lack thereof. “The very same holds true for public policies, in particular tax policies. By trying to prevent tax competition, OECD or EU member states wish to deprive the world’s citizens of their freedom to choose for themselves or for some of their activities the tax environment that they deem best . . . Using the tax oppression index, the 30 OECD (Organization for Economic Cooperation and Development) countries are ranked from the most oppressive (Italy and Turkey with indices of 6.0) to the least oppressive (Switzerland with an index of 2.0). The United States index is 5.3 (tied for 10th most oppresive with the United Kingdom). Gee, one might think that with the current economic conditions in the United States, e.g., unemployment at 9.5% and expected to increase to over 10%, the President and Congress would be working to reduce tax oppression rather than increasing tax oppression through burdening America with universal health care. Wait a minute, lower taxes and letting Americans have the freedom to choose where and how they receive their medical care would mean more liberty and less tyranny.What a concept! The following cartoon is used with permission of William Warren and Americans for Limited Government. Roll Call also reports, “The dispute over Brady’s chart is being reviewed by the franking commission, which must approve any mail before it can be sent. No decision had been made on the matter by press time.” Stay tuned! But that flow chart sure looks like reason enough to start over with healthcare reform. HT: Hot Air. Worth a read since "DafyDD Ab Hugh" thinks that "Brer Republican managed to trick Brer Democrat into flinging the Brady flowchart into the briar patch." Who Will Pay For The Employer Mandates? “President Obama promised not to raise taxes on workers earning less than $250,000 a year, and supporters of an employer mandate claim that they will not make low- and middle-income workers bear the burden of paying for it. The focus on the surcharge on those earning over a million dollars a year reinforces this impression. "And yet, the Statist has an insatiable appetite for control. His sights are set on his next meal even before he has fully digested his last. He is constantly agitating for government action. And in furtherance of that purpose, the Statist speaks in the tongue of the demagogue, concocting one pretext and grievance after another to manipulate public perceptions and build popular momentum for the divestiture of liberty and tyranny from its rightful possessors. The industrious, earnest and successful are demonized as perpetrators of various offenses against the public good, which justifies governmental intervention on behalf of an endless parade of "victims." In this way, the perpetrator and the victim are subordinated to the government's authority -- the former by outright theft, the latter by a dependent existence. In truth, both are made victims by the real perpetrators, the Statist." ~ Mark Levin, page 8, "Liberty and Tyranny: A Conservative Manifesto"
“Many seemingly contradictory statistics are cited on this issue, depending on the author's opinion of higher tax rates. If an author favors higher tax rates, he is likely to cite a statistic similar to this: only 4.8% of all tax returns with business income will face a tax increase. That's true because so many mom-and-pop businesses do not earn enough to pay the coming tax rates on high income. As the saying goes, “There are lies, damn lies -- and statistics.” And then there are taxes. “Government fraud has been in the news lately because analysts are expecting major abuses of the Obama administration’s $787 billion stimulus plan. One Deloitte expert argued that “swindlers, con men, and thieves could siphon off as much as $50 billion” of stimulus funds, which are vulnerable because policymakers are under pressure to shovel it out the door quickly. “Even more troubling is the potential for fraud and abuse created by President Obama’s other big spending proposals — particularly his giant health-care plan. Obama wants to inject hundreds of billions more tax dollars into federal health care instead of fundamentally reforming Medicare and Medicaid — broken programs that are already subject to Madoff-sized larceny. That is incredibly unfair to those of us paying the bills. Guess our Congressional grandees prefer spending more money to buy more votes rather than provide oversight over existing programs. Sheesh! “Yesterday CBO released a preliminary analysis, conducted with the staff of the Joint Committee on Taxation (JCT), of H.R. 3200, the America’s Affordable Health Choices Act of 2009, as introduced by several House committees on July 14. Earlier this week, CBO released a preliminary report on the health insurance coverage provisions of the bill; this latest report added analysis of the other provisions. “According to CBO’s and JCT’s assessment, enacting H.R. 3200 would result in a net increase in the federal budget deficit of $239 billion over the 2010-2019 period. That estimate reflects a projected 10-year cost of the bill’s insurance coverage provisions of $1,042 billion, partly offset by net spending changes that CBO estimates would save $219 billion over the same period, and by revenue provisions that JCT estimates would increase federal revenues by about $583 billion over those 10 years. “By the end of the 10-year period, in 2019, the coverage provisions would add $202 billion to the federal deficit, CBO and JCT estimate. That increase would be partially offset by net cost savings of $50 billion and additional revenues of $86 billion, resulting in a net increase in the deficit of an estimated $65 billion. “With their new health care plan House Democratic leaders seem to have abandoned the 'borrow now, spend now, pay later' philosophy for a mantra that is just as dangerous to our economy: 'tax now, spend now, and tax again.' Aside from the disastrous impact of the new income surtaxes, more may be in store for America's small businesses and entrepreneurs if the savings from the health care bill don't materialize. The two initial rates of surtax will double if savings targets aren't met. “Whatever else happens, the maximum combined federal tax rate in the U.S. will surpass those in France, Ireland, Italy, Switzerland, and the United Kingdom. Our rate will tie or even exceed that which burdens citizens in the People's Republic of China. The highest rate on dividend income would triple once the Bush tax cuts expire, and the rate on capital gains would reach a 15-year high. Forget about a bull market anytime soon. Dr. David Gratzer, a senior fellow at the Manhattan Institute, writes that "a Medicare-style public option in healthcare would kill private insurance," which is posted at U.S. News & World Report. Also at USN&WR, Mary Kate Cary writes the "White House (is) talking out of both sides of its mouth in blind rush for healthcare reform." Finally, Diane Furchgott-Roth, an adjunct fellow at the Manhattan Institute, writes about "a very unhealthy health bill" for Real Clear Markets on Thursday, July 16. And you thought I was pessimistic yesterday when I growled? Read the remainder of the director's post; it's that important. If You Think the Economy is Bad . . .
It’s worse, and you don’t need to think that it’s ACTA saying that although we’ve growled about that many times over the past few months. “The recent unemployment numbers have undermined confidence that we might be nearing the bottom of the recession. What we can see on the surface is disconcerting enough, but the inside numbers are just as bad. Their businesses are down 10, 20% or more. They have either laid off staff or have reduced hours to 4-day weeks trying to keep key staff. They have reduced their own salaries and in many cases have implemented “cross the board” salary reductions. They (for the first time in their lives) have no ability to forecast beyond 4 weeks. They see nothing good on the horizon that would benefit them re: sales, cost reduction, efficiency, etc. In other words, they are experiencing a loss of optimism and any positive outlook on the future. “My hope is to at the very least to try to sell these 5 businesses [information redacted]. “Prospects are slim. M & A deals are down (depending on the source) anywhere from 60% – 80%. I used to receive 20 – 40 inquiries from buyers every week. I now receive a handful a week. No wonder the economy seems out of control. It is, and adding more taxes and more regulation does nothing but add to the inability for entrepreneurs to plan. "This “surtax” is merely a thinly-veiled way to raise the top marginal tax rate. A 3% surtax on married couples making $1 million or more would raise the top marginal tax rate in 2011 to 42.6%, up from 35% today. “Raising income taxes at all, and marginal tax rates in particular, is a clear and unambiguous violation of the Taxpayer Protection Pledge. This Pledge has been made by 172 Congressmen and 34 Senators to their constituents and the American people. They promised not to raise income taxes or marginal income tax rates. “The news is worse for small business owners. Small business profits face taxation on their owners’ 1040 forms. Two-thirds of small business profits pay taxes in households making at least $250,000 per year. Thus, this marginal tax rate increase is a tax hike on $2 out of every $3 small business dollars. “This marginal tax hike will affect small employers and their employees. One-third of Americans work in firms with 2 to 100 employees. These small businesses, which must have profits to employ workers, will face these marginal tax rate hikes. The cost will be born out in lower wages and less jobs. In the Victor Davis Hanson column we referenced in yesterday’s growl, we note his comment that with the recovery “we are rewarding unproductive areas of the economy . . . and punishing the engines of the economy.” In short, we’re heading down the road to serfdom. “For the past half-century, federal spending has averaged about 20 percent of GDP, federal taxes about 18 percent of GDP and the budget deficit 2 percent of GDP. The CBO's projection for 2020 -- which assumes the economy has returned to "full employment" -- puts spending at 26 percent of GDP, taxes at a bit less than 19 percent of GDP and a deficit above 7 percent of GDP. Future spending and deficit figures continue to grow. “Economic policy, which became startling when Washington began buying automobile companies, has become surreal now that disappointment with the results of the second stimulus is stirring talk about the need for a ... second stimulus. Elsewhere, it requires centuries to bleach mankind's memory; in Washington, 17 months suffice: In February 2008, President George W. Bush and Speaker Nancy Pelosi, who normally were at daggers drawn, agreed that a $168 billion stimulus -- this was Stimulus I -- would be the "booster shot" the economy needed. Unemployment then was 4.8 percent. “This recovery cannot work, other than a brief spurt that results from trillions in printed money, because we are rewarding unproductive areas of the economy (federal money for more wind farms, federal hurdles for pumping more known natural gas or nuclear power construction; more of the community-organizing model, less of the productive small business model) and punishing the engines of the economy. “For Obama to pull this off, an entire sort of new vocabulary, rhetoric, and attitude is necessary. And the model is California: the carpenter and the bricklayer are laid off, and the state snoozes; while the assistant solid waste inspector of Green Acres is on television every night (his union can afford the advertising) to weep, and claim that if he and those like him (retire at 55 with $100,000 for life) are laid off, then Dantesque things follow. “Remember the logic: the poor Californian voter who works at Starbucks or Target is angry that the grandee social worker is unnecessary and grossly overpaid at $90,000 a year, with lush retirement and benefits, and so is told that if he does not raise taxes to over 10% income and 9% sales, then firemen, police, and water workers will quit/be laid off/furlow and so he will starve, be murdered, and have no sewage. "That is the model here in California and that is the model we are soon to see in Washington: the government worker and those who receive his largess, are kings; those who pay for them, and who work in private enterprise for far less, are, well, less than fools. Not a pretty picture for future generations. If you agree, call Senators Jim Webb and Mark Warner or Representative Jim Moran; the switchboard number on Capitol Hill is (202) 224-3121. Approval of the cultural center in Rosslyn appears all but certain when the Arlington County Board meets for its recessed meeting Tuesda meeting (agenda item 52.A.-F.). The thought of the Rosslyn cultural center came to mind when we read an editorial in last Sunday's Las Vegas Review-Journal. Las Vegas is planning a new city hall. However, the editorial notes it's "become more expensive and possibly unaffordable" with the mayor blaming "skittish financial markets" with higher interest rates costing "millions of dollars." "Watching local governments try to go "on the wagon" and stop spending increasingly scarce tax dollars during tough economic times can be like watching a family member try to "go cold turkey" on his or her own drug of choice. "You awaken at 2 a.m. to find the kitchen light on. And there's your loved one, puffing away on old butts recovered from a hidden ash tray." The taxpayers of Arlington County could say much the same as the Board gets set to approve a cultural center in Rosslyn. “In fact, the SSA reported that more than 10,000 stimulus checks were sent to the dead. The new ($787 billion stimulus) law provided a one-time payment of $250 for retirees, disabled individuals, and Supplemental Security Income (SSI) recipients. One would assume that the term “retirees” was meant to describe people retired from the workforce, not people retired from life. “These are not just the recently deceased of the past few weeks, months, or even a year. The government sent checks to one individual who had been dead for 42 years. That’s exactly what 83 year-old James Hagner of Orchard Beach, Maryland learned in May. He received a check from the U.S. Treasury made out to his mother, Rose, who died in 1967. “Last week I wrote an article for the June issue of Wastewatcher entitled Stimulating the Dead. Sending stimulus checks to dead people does not help the economy. “Little did I know that this is not a new practice of the Social Security Administration (SSA). They have been doing this for years. What’s worse is that they have known about it for years, but just can’t seem to fix the problem. “SSA made payments to more than 6,000 beneficiaries for months or even years after receiving notification the beneficiaries were deceased. SSA received death reports for these beneficiaries and recorded dates of death on the Numident. However, SSA did not record the death information on the beneficiary’s payment record or terminate benefit payments to these individuals. Our audit results indicated that a large percentage of these beneficiaries were actually alive, and that death entries recorded on their Numidents were erroneous. However, our audit results also indicated that a number of these beneficiaries were deceased, and that dates of death recorded on their Numidents were accurate. In January 2008, we identified 305 beneficiaries7 who received OASDI and/or SSI payments at the same time their Numident record indicated they were deceased. During our review, we verified the living status of 228 of these 305 beneficiaries. Our review found that 88 of the 228 beneficiaries were, in fact, deceased, and that death information appearing on the Numident was accurate. In these cases, SSA issued payments to the beneficiaries 2 to 366 months after receiving notification the beneficiary as deceased. SSA improperly paid these 88 deceased beneficiaries approximately $2.0 million. We also confirmed that 140 of the 228 beneficiaries were alive, and the death entries on the Numident were erroneous. The addition of erroneous death entries can lead to benefit termination, cause severe financial hardship and distress to affected individuals, and result in the publication of living individuals’ PII in the DMF. And Americans want Congress and the Administration to impose universal health care? Sheesh! “Those who pushed through this year's $787 billion fiscal "stimulus" seem to be counting on the American people's short memory. Wasn't it just last year that we were told, repeatedly and with stark emphasis, that this economy was the "worst" since the Great Depression? “That was the pretense for not only the stimulus, but for the federal takeover of the U.S. auto industry and the quasi-takeover of the U.S. financial industry. It's also the underlying premise for both nationalized health care and massive new taxes to cut CO2 emissions. “If the stimulus passed, the White House vowed, unemployment would peak at 8%. Today, it's 9.5% — and rising. “Those who argue doing nothing wasn't an option are wrong. We would now be emerging from this recession if the government had left well enough alone. The Fed's interest-rate cuts to zero last December would have been plenty. HT Mark Levin Show. He discussed the economy and the impact of a second stimulus during the first hour of his show this evening, and includes several additional news links. It’s amazing how the government shills whine about falling revenues. The New York Times is the latest, writing in the lede paragraph on Sunday. In Arlington County, the Board of Equalization of Real Estate Assessments (BoE) is the second-level review of the assessed value of your real property although there can be a first-level, or administrative, review. Property owners not satisfied with the decision of the BoE can appeal the BoE’s judgement to the Circuit Court. As of this evening, the agendas (but not the decisions of the BoE) for the June 10 and June 17 meetings have been posted. BoE meetings are open to property owners and taxpayers. HT: Jeff Dircksen blogging at NTU's Government Bytes. Glenn Reynolds at Instapundit links to reports of tea parties in New Jersy, Austin and Dallas, Texas, Nevada, Massachusetts, South Carolina, Indiana, Idaho, Arkansas, Michigan, Minnesoa, Florida, New Mexico, and Conneticut. CNN+Politics reports on the tea party outside the U.S. Capitol. San Jose Mercury News reports on one of California's tea parties. Big Spring Herald reports on local conservatives in Big Spring, Texas celebrate; includes picture of a great young conservative with her sign. Pittsburgh's WTAE. channel 4 reports on "excessive taxation" protest in Schenley Park. Washington Times has its own round-up here. In Virginia, here are reports from Danville, Roanoke, Charlottesville, and Stafford County. And from Small Gov Times. The Visalia Times-Delta reports that over 15,000 attended the Freedom Rally Tea Pary in Tulare. One more, from World Net Daily, another round-up reporting more than 2,000 tea parties nationwide. Finally, start getting reading for the September 12 Taxpayer March on DC. Remember the following logo, which is from the website of the National Taxpayers Union. “Rep. Waters’ grandiose gesture is a reminder that Congress still has not banned the practice of earmarking taxpayer funds for pork projects, including monuments, academic facilities, roads, airports and water projects, that are named after themselves. The practice, colloquially tagged as “Monuments to Me,” became the subject of scathing news reports in 2007 when House Ways and Means Committee Chairman Charles B. Rangel (D-N.Y.) was exposed for his $2 million earmark for the Charles B. Rangel Center for Public Service, the Rangel Conference Center, and the Charles Rangel Library at the City College of New York. It came up again in the recent weeks, when news stories cropped up questioning how $150 million in earmarks over the last 10 years were secured to fund the construction and maintenance of the nearly-deserted John Murtha Johnstown-Cambria County Airport in Johnstown, Pennsylvania. The following editorial cartoon is used with the permission of William Warren and published by GetLiberty.org. “It was not a poll-driven summation of current opinion. . . .
“The signers did not even seek a vote of the people . . . .
“The men who signed the Declaration of Independence represented the absolute opposite of "interest group politics" so slavishly worshipped in political science departments. They pledged their lives, their wealth, their liberty, and their honor -- everything -- on a toss of the dice. Often, even if the revolution won, these men personally lost. The game was not about them, their economic interest, or their political ambition. They won if America became a new order of liberty in the world. Interest politics would have led them all to make peace with the Crown. Moral principles led them to what Churchill would later call "blood, toil, sweat, and tears." Take a few moments this weekend to study the Declaration of Independence. You can find it among the Historic Documents at Patriot Post. Congress Hard at Work? Not! “The spending on overseas travel is up almost tenfold since 1995, and has nearly tripled since 2001, according to the Journal analysis of 60,000 travel records. Hundreds of lawmakers traveled overseas in 2008 at a cost of about $13 million. That's a 50% jump since Democrats took control of Congress two years ago. HT Mark Levin Show. See also our June 29 entry in which we blogged about the nation's long-term economic outlook.